Salt cod has been around for a long time. Back in the days before refrigeration, salting was one way to preserve foods for longer storage. I first became acquainted with it when I moved to New England and noticed that a barrel of dried fish would appear in the grocery store around the holidays. Ever curious, I bought some and looked up what to do with in “The Joy of Cooking” (this was pre-Internet). Brandade, a salt cod and potato puree, was the “gateway” recipe for preparing this flavorful (from the salt) mild fish. 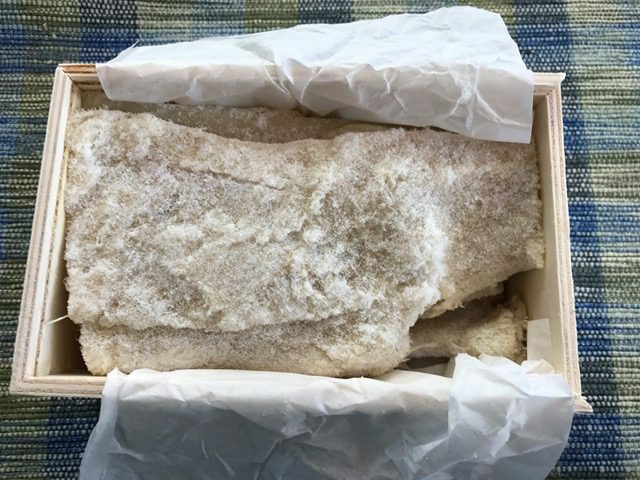 Over the years, I’ve prepared salt cod a few times, when I saw it for sale, but it had been a while since I’ve seen it around. When Brandade came up as December’s bonus recipe for Cook the Book Fridays, I smiled, remembering this hearty dish fondly. It took me a while to track down the dried fish, so I missed the earlier recipe, but it came up again this week with Salt Cod Fritters. 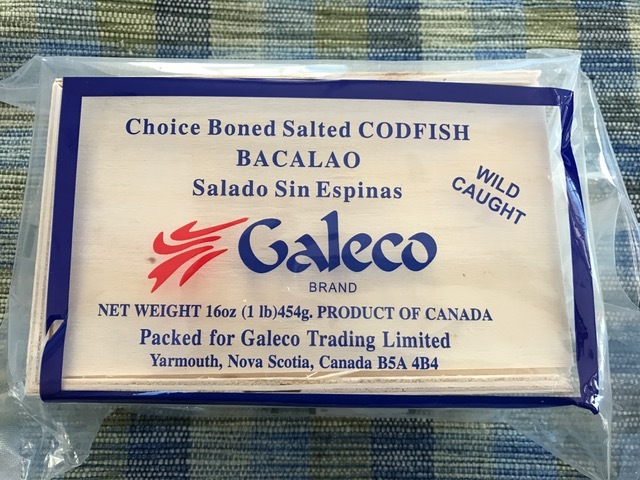 When using salt cod, you must plan ahead. A day or two of soaking with regular water changes is required to leach the salt from the fish so that it’s edible (i.e. not unbearably salty). Once the fish has been de-salted, it’s time to make brandade, which is surprisingly simple, not much more work than making mashed potatoes. David Lebovitz’s version starts by infusing olive oil with garlic and thyme. Then, the fish is simmered with chunks of peeled potatoes until everything is tender. 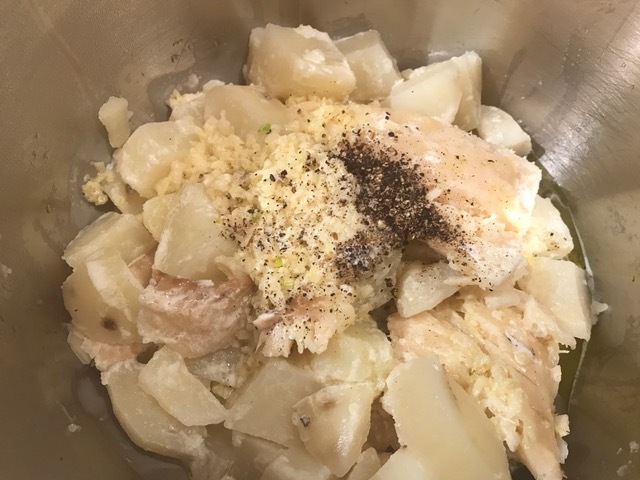 After draining, the fish and potatoes are pureed in a stand mixer along with cream, the garlic-infused oil, salt and pepper, which makes the richest, most delicious mashed potatoes you’ve ever had. To turn this into dinner, there’s one more step. 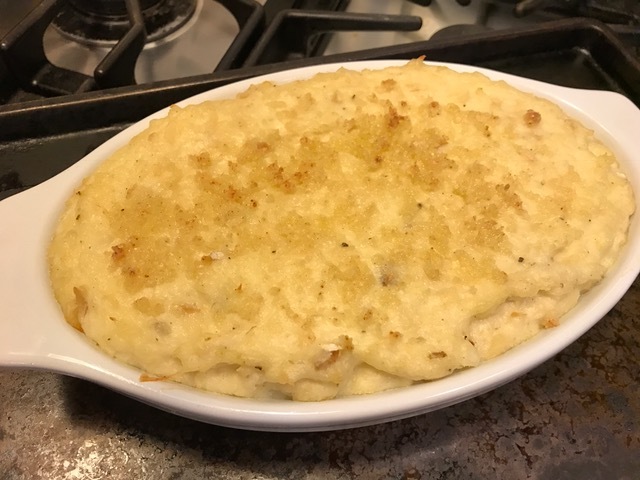 The brandade is transferred to a baking dish, sprinkled with bread crumbs and grated Parmesan cheese, and baked until lightly browned and bubbly. The dish of brandade can be served with a salad for dinner (that’s what we did) along with some toasted bread. It could also be served as a spread for a party appetizer. We ate half of the brandade for dinner. A day or two later, I made salt cod fritters with the other half. You might know that I’m terrified of deep-frying. I also can’t get my head around the volume of oil required to do this. It grosses me out. I was happy to hear from some of the other cooks in this group that shallow-frying worked too. I liked that the salt cod balls, made from brandade mixed with bread crumbs, could be rolled earlier in the day. That left only the step of mixing the batter and cooking for dinnertime. 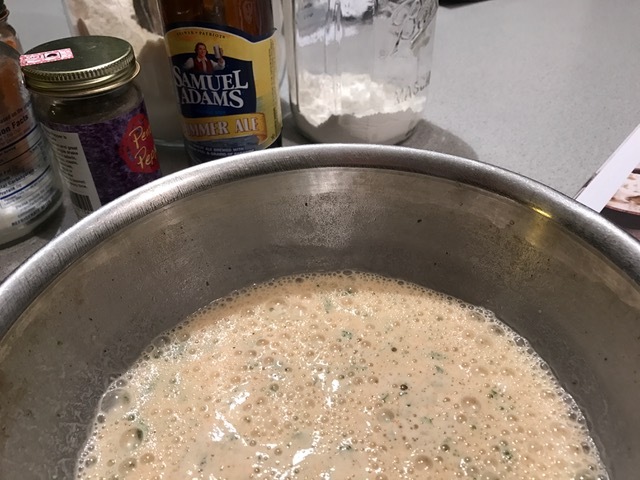 The well-seasoned beer batter sits for half an hour, which leaves ample time to mix up the tartare sauce. 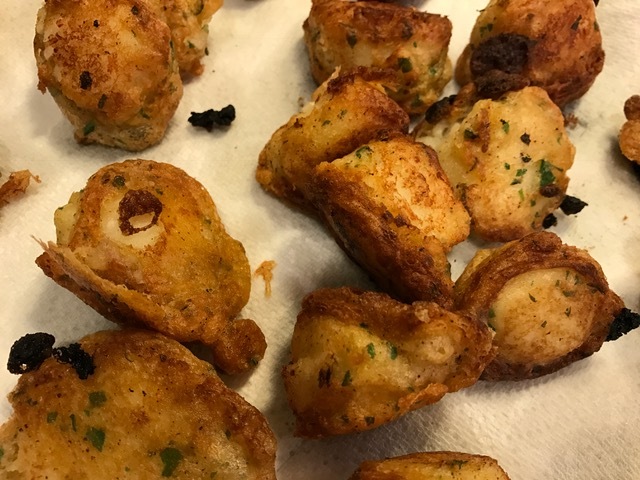 To cook the fritters, the salt cod balls are dunked in the batter and the excess drained off (as best as you can, not so easy), then fried in hot oil. The batter was thick and when I placed the balls in the oil, more of the batter dripped off, creating a little pancake base. This happened each time I turned the fritters, resulting in pyramid shapes instead of balls. Towards the end, I tried flattening the balls into patties before dipping and frying. I found this to be less frustrating. I’ve successfully converted from pan-frying to baking my crab cakes, so I also wonder whether the batter-coated patties can be baked instead of pan-fried. I think the fritters are intended as an appetizer, but I served them with salad for dinner. I would definitely make brandade again and might make the fritters. Both would make fabulous additions to the Feast of Seven Fishes that we attend on Christmas Eve. Lauren, if you’re reading this, what do you think? I’ll try to remember to ask you again in December. 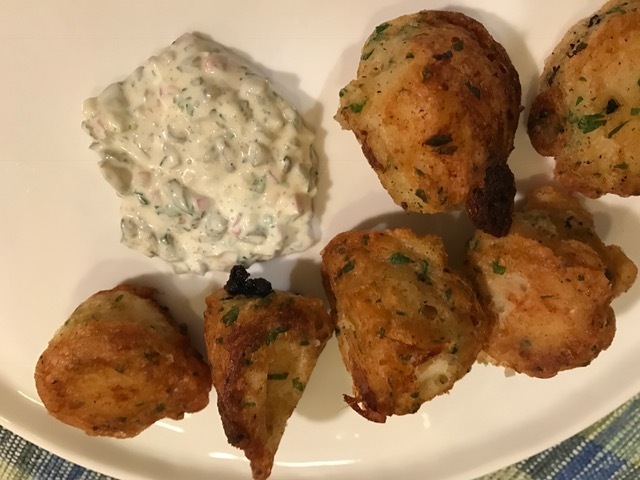 Check out what the other bloggers from Cook the Book Fridays thought about salt cod fritters or brandade. You can find the recipes in David Lebovitz’s delicious book My Paris Kitchen on page 73 (fritters) and page 144 (brandade). I’ve seldom met a fish I didn’t like. Sure, I like some more than others, but, generally speaking, I’m always happy when fish are on deck. Sardines often get a bad rap. I’ve never had a problem with them. They are Their flavor is strong, but if you’re eating fish, why not embrace its fishiness? This week’s recipe for Cook the Book Fridays is Sardine Rillettes. If you want to whip up a starter for fish-loving friends, this fish spread is an excellent choice. 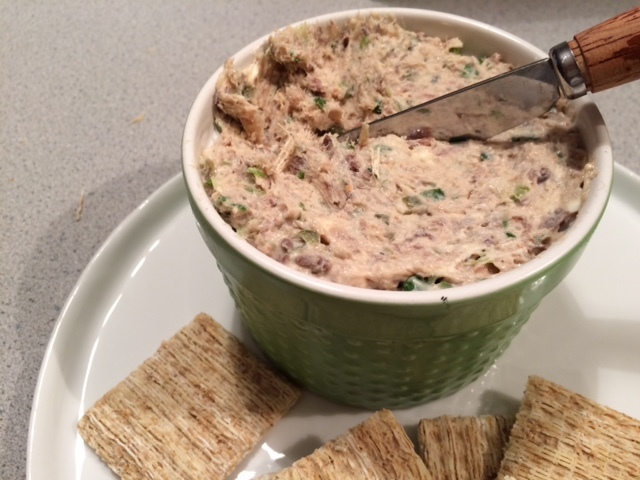 I made sardines rillettes once before when I was participating in French Fridays with Dorie. Dorie’s recipe was easy, but David Lebovitz’s is even easier: less ingredients to chop. 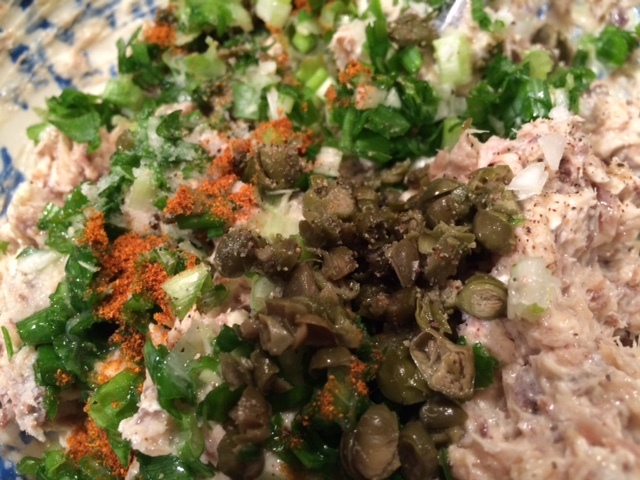 For his version, canned sardines are pureed with softened butter and cream cheese along with scallions, capers, and a touch of lemon juice. I was lucky to find boneless sardines at Trader Joe’s which made the recipe even simpler. No guests to share with, but we enjoyed the sardine spread on crackers before dinner all week long. I’m always looking for new appetizers, so I will try to remember this one the next time company is coming. To make this yourself, you can find the recipe on page 78 of My Paris Kitchen by David Lebovitz. My blogging friends’ thoughts can be found by following the links to their posts here.